"My husband went salmon fishing for the first time and now we have salmon in the ... read full review"
"My husband went salmon fishing for the first time and now we have salmon in the freezer. We want to grill it and found some recipes on this site that look good. 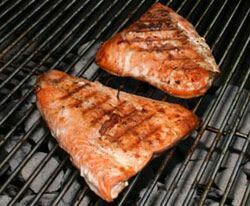 Then we found this related info on grilling salmon that has been really helpful, especially since this will be the first attempt at grilling salmon. Thanks for the info." "We had gotten some salmon given to us by my brother-in-law after his Alaskan fishing trip. 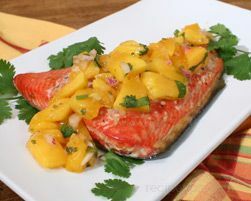 We wanted to grill it so when I found this information it was very helpful since I had never grilled salmon before. We salted it a few minutes before grilling and cooked it about 3 minutes per side. It turned out really good."